Day 2 Arrive in Zurich, Spend the day in the city. Day 3 Depart to Innsbruk, Austria for the day and arrive in Salzburg, Austria after dinner. Day 4 Salzburg, Mozart home, Hohensalzburg Fortress, shopping. Day 7 Prague – Mala’ Strana, Josefov (the Jewish Ghetto), Petrin, Church of Our Lady. Day 9 Budapest: Market Hall, Vaci’ Street, Buda Castle, Parliament Building, and more. Day 14 Returning travelers fly home while the remaining travelers have a rest day. Note: Itinerary and/or hotel may changes prior to or during tours. 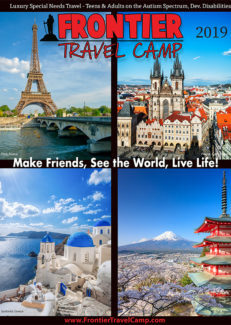 Frontier Travel Camp will travel back in time to many of the most wonderful cities of Eastern Europe. Travelers will fly into Zurich, Switzerland on July 7th. After a day of a little rest and a tour of this beautiful Swiss city, travelers will be off Austria for some time Innsbruk and then to listen for the “sound of music” in the fairytale city of Salzburg, Austria. We’ll spend a few days visiting the Hohensalszburg Fortress, the home of Mozart, and we’ll walk in the footsteps of Jule Andrews through the hills of the area. Then we’re off to Prague in the Czech Republic. This fascinating city is full of unique history and phenomenal beauty. From the Charles Bridge to Prague Castle, the clocks from the middle ages in Town Square to the meandering and numerous cathedrals to the Vltava River we will be wowed with every turn we take. And if you think that Prague isn’t pretty enough, wait until you see Budapest. This stunning city on the Danube River is loaded with art and its own wealth of history. We’ll spend a day touring the city and a day at the Sze’chenyi Thermal Baths and Spa. We’ll also get to see Market Hall and Vaci’ Street which is the main pedestrian shopping mall that meanders through one side of the river. Budapest is one of those unique European cities that you’ll find yourself thinking about for years to come.. Finally, we will end this two weeks touring the beautiful Austrian City of Vienna. The Guardian Magazine named it the best city to live in the world. It’s history is marked by, among many other things, the music of Beethoven and Mozart, the intellectual mind of Sigmund Freud and the incredible art of Gustav Klimt. We’ll spend a few days getting to know this great European city and even have a chance to go to Bratislava, Slovakia which is less than an hour away. Don’t miss this unique opportunity to see this region of Europe.